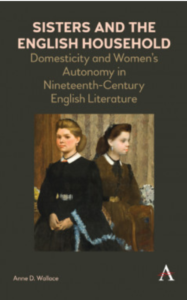 Sisters and the English Household revalues unmarried adult sisters in nineteenth-century English literature as positive figures of legal and economic autonomy representing productive labour in the domestic space. As a crucial site of contested values, the adult unmarried sister carries the discursive weight of sustained public debates about ideals of domesticity in nineteenth-century England. Engaging scholarly histories of the family, and providing a detailed account of the 70-year Marriage with a Deceased Wife's Sister controversy, Wallace traces an alternative domesticity anchored by adult sibling relations through Dorothy Wordsworth’s journals; William Wordsworth’s poetry; Mary Lamb’s essay ‘On Needle-Work‘; and novels by Jane Austen, Elizabeth Gaskell, Charles Dickens, Dinah Mulock Craik and George Eliot. Recognizing adult sibling relationships, and the figure of the adult unmarried sibling in the household, as primary and generative rather than contingent and dependent, and recognizing material economy and law as fundamental sources of sibling identity, Sisters and the English Household resets the conditions for literary critical discussions of sibling relations in nineteenth-century England. In the twenty-first century, literary scholars have increasingly explored the significant historical distance between the ways we name, plot and characterize sibling relations, and the quite different ways that pre-twentieth-century writers and readers might have done so. Yet, as Mary Jean Corbett and Naomi Tadmor have separately argued, efforts to historicize our understanding of English families over the crucial transitional period of the eighteenth and nineteenth centuries have been weakened by scholars’ reliance on terms and ideas that assume stable, universally human familial structures and relations. When we focus on the sibling relation, this reliance proves particularly limiting, driving continuing tendencies to define ‘brother’ and ‘sister’ in terms of sexual, specifically conjugal relations that reinscribe those stabilizing concepts, or to subsume the sibling relation into other categories, eliding its potential primacy in ‘family’. Sisters and the English Household works to escape these lingering critical limitations through two innovations: a reframing of efforts to historicize ‘family’ as a further historicizing of ‘domesticity’ that renders it multiple and fluid rather than monolithic; and a turn towards the unmarried adult sister as a figure of legal and economic autonomy representing productive labour in the domestic space. The book traces two distinct nineteenth-century ideals of domesticity, one of which understood sibling fortunes as fruitfully intertwined through the full extent of the siblings' lives (corporate domesticity), while the other expected the domestic, material and, to some extent, emotional separation of adult siblings from their birth-homes and from each other (industrial domesticity). The second configuration, although counterbalanced by persistent idealizations of the first, sibling-anchored model, was gradually and unevenly ascendant through the period. As households came to be primarily defined by the relations between spouses, and between parents and children, the mutual householding and devotion of siblings, once expected features of family life, began to seem extraordinary. More specifically, as a domestic space defined by the apparent exclusion of productive labour was increasingly idealized, the adult unmarried sister in the house became an object of intense cultural scrutiny, her troubling autonomy rendering her the crucial figure in the English nineteenth-century’s protracted cultural negotiation of familial, household and domestic ideals. The sister's autonomy also drove a gradually increasing imperative to exclude adult unmarried siblings from the households of their married siblings, an imperative figured as expatriation from the homely and national ‘domestic’ space. Anne D. Wallace is professor of English at the University of North Carolina Greensboro, USA. The author of Walking, Literature, and English Culture (1993), Wallace has also published articles on John Clare, Charlotte Smith, Dorothy and William Wordsworth, and Elizabeth Barrett Browning.